After spatial thinkers like Keller Easterling, Beatriz Colomina or Chantal Mouffe, the Critical Spatial Practice series edited by Nikolaus Hirsch and Markus Miessen now publishes a short book by Eyal Weizman, entitled The Roundabout Revolutions (Sternberg Press, 2015). In it, Weizman briefly introduces the research work (with Blake Fisher and Samaneh Moafi) that preceded the design of a folly for Gwangju (South Korea) Biennale. 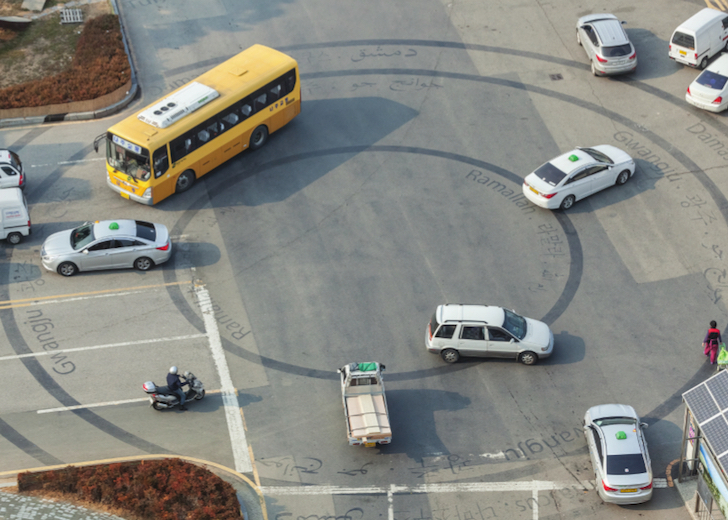 This architectural intervention mostly materializes by circular marks on the asphalt floor corresponding to the circumferences of seven roundabouts of the world that hosted large insurrectionist movements in the recent years (to the exception of one): from the smallest to the largest, Ramallah’s al-Manara square (2011), Gwangju’s Provincial Hall roundabout (1980), Damascus’s al-Sabaa Bahrat Square (2011), Tunis’s Place du 7 Novembre 1987 (renamed after the revolution to Place du 14 Janvier 2011), Cairo’s Tahrir Square (2011), and Tehran’s Azadi Square (2009). More squares would need to be added to this list (Manama’s Pearl roundabout, Kiev’s Maidan Square, Istanbul’s Taksim Square, etc.) and some of them are indeed described in Weizman’s book, which undertakes to introduce the genesis of this particular urban typology. Self-regulation, as Michel Foucault taught in his work on governmentality, is not only about the free interaction of agents, it is also about the creation of a frame within which such interaction can take place. The roundabout could thus be seen as a literal (and somewhat comical) diagram of this principle: it is an apparatus that combined a set of elements including the urban form of the street circle, traffic regulation, and the production of a modern subject (the driver) who can self-regulate. The roundabout’s unfulfilled promise, however, like that of deregulated capitalism, was to optimize flow with minimum top-down intervention. Just like the “self-regulated” market, it has not only come into crisis, it has become the mode by which crisis took shape. The roundabout is thus not just any space in the politics of the city: it embodies a paradigm of the contemporary mode of governmentality. Although Weizman does not evoke it in the book, we might want to add to the self-regulation allowed by the flux diagram it organizes, the form of sacredness that embodies its center. 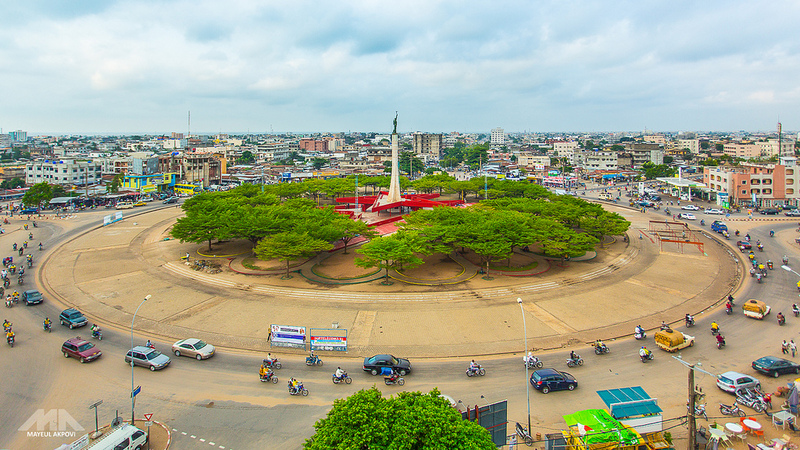 In fact, the principle of a roundabout is the continuity of the circular flow, thus forbidding, in principle, the access to its center that, in consequence, often becomes the host of an architectural fetish: Christopher Columbus’s statue in New York, the Arc de Triomphe in Paris, the obelisk of Buenos Aires, the lions fountains of Ramallah, the Azadi Tower of Tehran (see past article), the Red Star of Cotonou (see below), etc. The insurrectionist movements that took over the roundabouts thus transgressed twice the governmentality embodied by the roundabouts: these movements shut down their continuous fluxes, and desacralized their centers. They inverted the centrifugal force of the roundabout, which forces cars and bodies out of its orbit, into a centripetal force driving them to its center. The specific case of Manama’s Pearl roundabout in the context of the massive social movement against the Bahraini monarchy is particularly interesting, since the violent suppression of the demonstrators by the army was immediately followed by the destruction of the roundabout itself, including its fetish, the Pearl Monument despite the icon it represented for the country. The photographs at the beginning of this article show well the transformation that occurred through this destruction: the car circulation lost its circular scheme to be replaced by a converging star-like intersection, thus denying the center of the square to the deployment of bodies. Whoever in the Bahraini government or army conceived this destructive scheme acted as an urbanist like Haussmann or Cerda. 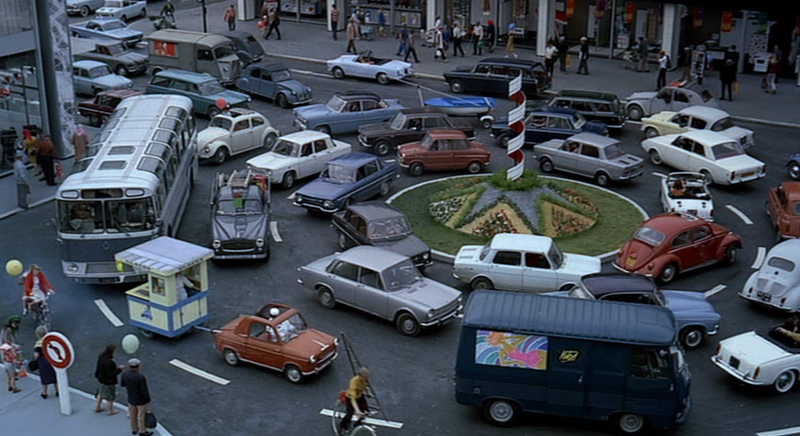 There is no space of emancipation in the city: urbanists cannot create a space that would allow democracy to be practiced and the subversion of the roundabout’s inherent propensity described above is an illustration of how insurrection necessarily takes form in the disruption of the normal function of a urban space. However, the corollary of this affirmation is paradoxically not true: the organization of bodies in space (what we name architecture) necessary provides control to the way the city and its inhabitants operate. On July 14 1790 in Paris, exactly one year after the beginning of the French Revolution, took place the Fête de la Fédération, a gigantic gathering of about 100.000 people to commemorate the revolution and look towards its future. The architecture conceived for this event does not escape from the problematic aspects described above; yet, we have to insist on the fact that it is mostly based on its own absence, or rather, it consists in an exercise of calibration of the void. This is the common point to the revolutionary roundabouts: the balance between the void they constitutes and the relatively dense urban fabric that surround them provides a calibration for which architecture’s control can be radically reduced by groups of bodies. Such a balance is feared by States and other transcendental modes of governmentality that tend not to reproduce it in their design, as we observe with the current plans for the Sisi administration’s new capital of Egypt (see past article). New incarnated forms of subversion of the controlled space that emerge from these new plans will thus have to be found.